Oracle Whenever Phyrexian Reaper becomes blocked by a green creature, destroy that creature. It can't be regenerated. 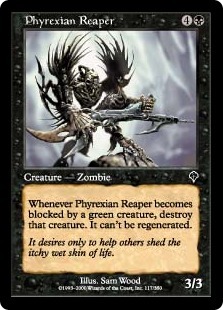 Flavor Text It desires only to help others shed the itchy wet skin of life.